Coast Rye Knot Brown | Drink. Blog. Repeat. A quick glance through my archives will tell you my eh/meh relationship with brown ales. Some really do stand out, but more often than not, the style just falls flat for me. I’ve got nothing against it. It just doesn’t do it for me. 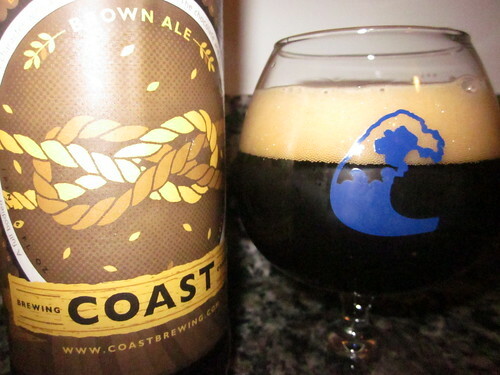 And then I have Coast‘s Rye Knot Brown Ale and realize everything else pales in comparison. Rye Knot was the first seasonal Coast ever put out and has since become their fall seasonal. Along with the usual chocolate malts, rye is also used, giving it a great spicy character you don’t get in most brown ales. I love rye, and this it definitely works in this beer. I’ve had it a few times before but never really had the chance to sit down and appreciate it, so here we go. The appearance is pretty surprising for a brown ale. There were two to three fingers of a really fluffy head that left behind some really strong lacing, and a nice foamy film lingered over the top of the the beer. It’s not the thin, weak head I’ve encountered in a lot of brown ales. The nose gives off those classic brown ale notes, with a toasted nuttiness and a bit of caramel. And on the back is a really nice spiciness from the rye. There’s just a hint of a chocolate note and a little bit of roasted coffee, but overall it that classic brown ale with a slight twist. There’s a mix of spice and carbonation that really bites on the front of the tongue. The carbonation continues throughout the mouth, scrubbing the palate. The sweeter notes are stronger toward the front of the taste, with caramel and chocolate taking the lead. That develops into a rich nuttiness as it moves further to the back. And then on the finish, there’s a big mix of the spice from the rye and roasted coffee. Even with all the carbonation, the beer is incredibly creamy. The mouthfeel is silk, a nice contrast to the biting flavors toward the finish. I’ve had Rye Knot a few times in the past but I don’t remember it being this good. It’s an example of contrasts that work in perfect harmony. The sweetness of the chocolate malts and caramel flavors compared with the spices from the rye and crispness of the carbonation. It’s easily a great twist on the style that makes it one of the best browns I’ve had.